Our home field lies in historic Carroll Park in Bay City, Michigan(Park and 5th St.). We feel it is important to play home games at a public park where residents can enjoy watching and participating in our games. Located in the heart of the Center Avenue historic district, Carroll Park is an ideal location for Indpendents 1800s base ball. Carroll Park was dedicated in 1875, and was designed by the famous landscape architect, Frederick Law Olmstead, who also designed Central Park in New York City and the Rose Garden at the White House. 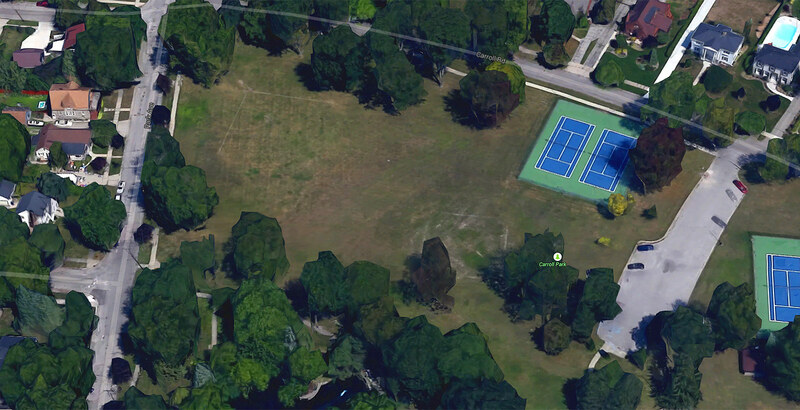 We play in the unmarked field at the northwest corner of Carroll Park. Look for our “Ball Game Today” sign while you are motoring down Center Avenue. Please bring your own seating (lawn chairs, etc. ), because there is no field seating available. Our tournament event will be held in the heart of Bay City surrounded by the Saginaw River at Middleground Island. This isolated field setting will give visitors the feeling of stepping back in time. Centrally located in the heart of the old lumbering area of Bay City. We’re sure that this experience will allow spectators to get a glimpse of what base ball was meant to be when it was played at the Elysian Fields in the Mid-19th Century. The tournament will be played in the unmarked field south of the Lafayette St. bridge.